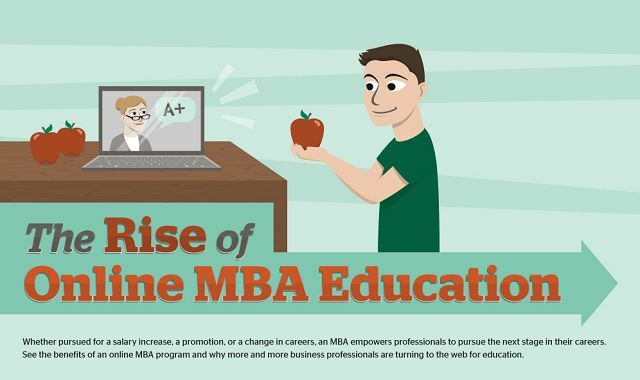 The Rise of Online MBA Education #infographic ~ Visualistan '+g+"
In the technology driven age that we live in there is much controversy over online schools vs. campus universities, there are key differences in each one that sets them apart. What isn't taken into account often is that many students’ lives cannot accommodate their work life, home life, and all day on campus going to classes, so to take best advantage of the time they have online schooling is a huge opportunity. Many busy working Americans can enroll in an online MBA program part time, and within three years raise their annual earnings by $40,000 from a bachelor’s degree profession. Ohio University (onlinemba.ohio) shows how the online MBA program has become a savior for many of the busy Americans that want to further their education, without sacrificing their livelihood. Many students prefer online education over in classroom campus universities, some of these reasons have been recorded as interactions with diversity of students, diversity of specializations, Accessibility from anywhere, adequate structure, etc.